During last night’s State of the Union address, President Obama argued that government should do less for the rich and more for the middle class. The insinuation here is that government tax and spending benefits are not progressive enough and don’t do enough to redistribute incomes from the top to the bottom. What Obama failed to do, however, was present any facts on how progressive the current system is so that people could judge whether they would like more or less redistribution. In 2009, Tax Foundation economists did such a “fiscal accounting” to see how much families at different income levels received in all government spending benefits relative to how much they pay in all federal taxes. We found that federal tax and spending policies are already very progressive and redistributive. 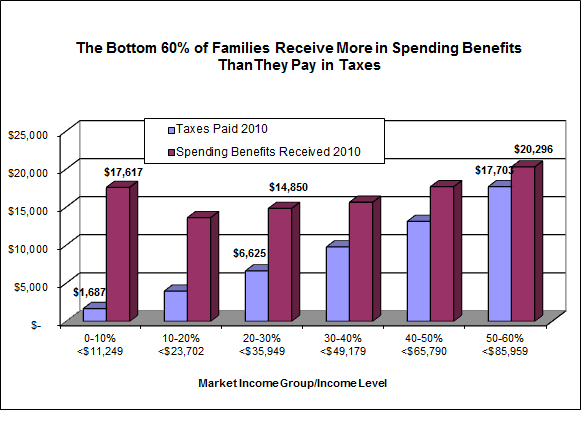 As the charts below indicate, the bottom 60 percent of families – those earning under about $85,000 in 2010, receive more in total spending benefits from government than they pay in all taxes combined. 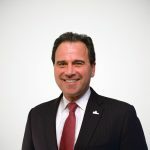 In other words, the benefits they receive from government – from education and roads to national defense and welfare – greatly exceed all the federal taxes they pay – from income and payroll taxes to gasoline and corporate income taxes. 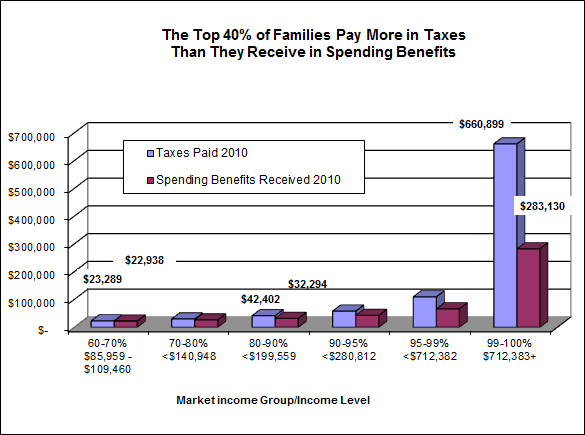 Indeed, the lowest-income Americans paid less than $1,700 in total taxes, but received $17,617 in spending benefits. In other words, they received more than $10 in spending benefits for every $1 they paid in taxes of any kind. Remarkably, middle-income families – whom Obama says government does not do enough for – got $1.15 in spending benefits for every $1 they pay in taxes. By contrast, the top 40 percent of families pay far more in taxes of all kinds than they receive back from government in benefits. For example, families earning between roughly $86,000 and $110,000 paid an average of $23,289 in total taxes, but received $22,938 in benefits – equal to about 0.98 cents on the dollar. The wealthiest families, those earning over $712,000, paid more than $660,000 in taxes but received $283,000 in spending benefits – equal to about 0.43 cents on the dollar. Our study actually tilted the spending to favor the rich by assuming that they benefit from public goods – such as national defense and public health – in proportion to their income. Meaning, the more you earn the more you benefit from defense spending and so forth. Had we assumed that public goods benefit everyone equally, the rich’s ratio of spending to taxes would have shrunk to 0.05 cents on the dollar while the poor’s ratio of spending to taxes would have grown to $14.75. Even before Obama’s policies were put in place, we estimated that federal tax and spending policies served to redistribute more than $826 billion annually from the top 40 percent of families to the bottom 60 percent. The president says that is not enough. That’s fine, but he should be honest about what amount of redistribution he thinks is enough. Then the American people can decide with all the facts before them.